Two of the main reasons social media marketing appeals to small businesses are the low cost of entry and the ability to interact with customers and prospects directly. Yet time and personnel resources are required to do it properly. The use of images can help increase engagement on social media and in other forms of marketing as well. This infographic shows how images affect social media, local search, articles, press materials, and ecommerce. Not all businesses lend themselves easily to images, however. If your product or service is hard to describe, consider using staff photos, work environment or field pictures, or animated video solutions instead. Each social network has unique sizes for the best image display. What looks good on one may not on another. This photograph-filled infographic will help your business look its best on the following networks: Facebook, Twitter, Google Plus, Instagram, Pinterest, LinkedIn, YouTube, Tumbler, Vine, and Snapchat. Having a strategy and plan of action can make social media marketing more efficient. This checklist starts by having you define your target audience and list the challenges they face so that you can create relevant, engaging content. It then offers a customized approach to creating content for blog posts, Facebook, Twitter, LinkedIn, Google Plus, Pinterest, YouTube, and SlideShare. Getting into a routine makes social media marketing easier and increases engagement. This infographic breaks tasks down into daily, weekly, monthly, and quarterly duties. Also included are the number of times you should post to different networks, ways to reach out to others, how to review your work, monitor social networks, and respond to messages and mentions. Creating a social media post that interests and engages your targeted consumers is a primary goal of social media marketing campaigns. Learn what makes a successful post on blogs, Facebook, Twitter, Pinterest, Google Plus, LinkedIn, Instagram, and other social networks, and how to tailor your message for the most visibility. Writing a blog post is just the first step in providing relevant information to your target audience. You also have to get people to read and share it. This infographic presents numerous ways of increasing your blog’s reach that includes advice on writing titles, optimization, creating Pinterest-friendly images, and sharing and re-sharing of content. This infographic covers the four steps involved in creating Twitter Cards and the benefits reaped from doing so. It lists the different types of cards and outlines steps for making tweets more engaging using them. It also features tips on choosing the card type, adding meta tags, card validation, and measuring results. Without leaving Twitter, and by using Twitter Cards, followers can download an app, visit a landing page, sign up for a newsletter, or use a coupon. Do you need a better understanding of Pinterest? This comprehensive Pinterest infographic gives business owners useful statistics, conversion facts, set-up and board creation tips, and strategic actions to form a plan of action. 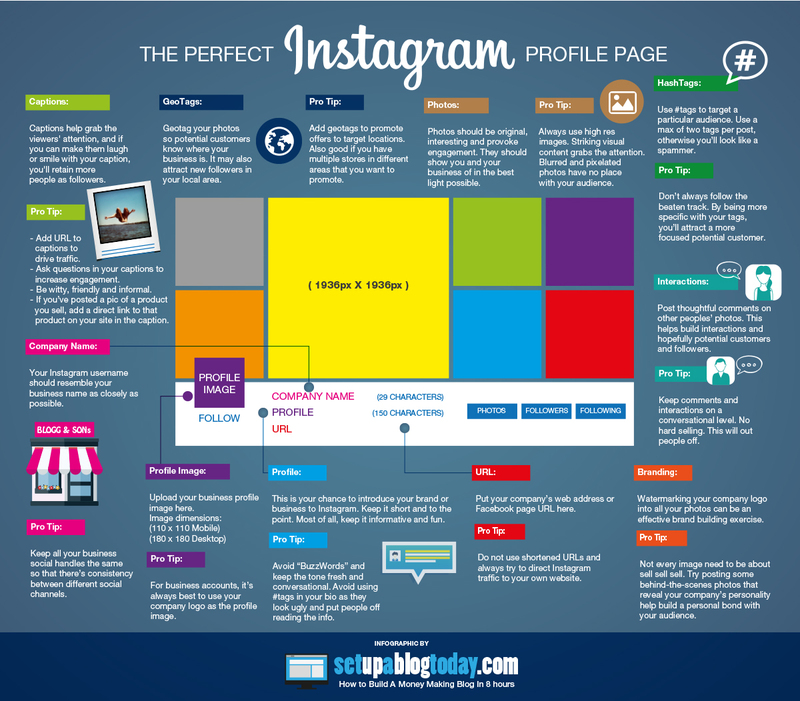 Featured in the informative article “9 Instagram Growth Hacks for Your Local Business,” this infographic helps companies create a complete Instagram profile. Included are posting tips, such as adding URLs to captions, using geotags on photos and offers, and creating engaging captions that have the right conversational tone. Hashtags are still a mystery to many business owners. Those that use them see an increased engagement rate. This infographic explains what hashtags are, why they are useful, the protocols for their use, and tips for conducting a successful hashtag campaign.